It’s time to get messy! Shaina from Take A Bite Out of Boca enjoyed a night full of food, wine and art with Savor Our City on the first ever tour with Vino Van Gogh. Read the rest of the review and see more photos here! 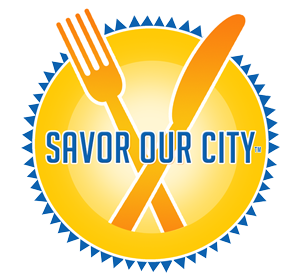 Savor Our City “Takes A Bite Out of Boca” on the Savor Downtown Boca Tour! It’s about time Savor Our City came to Boca! Shaina from Take A Bite Out of Boca was very excited to see the tour in her stomping grounds. Denise has finally brought Savor Our City Culinary Tours to Boca! I have been waiting for this ever since she started her tour business in Delray. Boca has such a vibrant restaurant scene that I knew it wouldn’t be long before the owners and chefs would want to get on board. For those of you who may not be familiar with this incredibly tasty tour, Savor Our City was founded by my good friend Denise Righetti. She leads groups through a series of stops at restaurants and specialty shops and introduces everyone to delicious flavors, beautiful scenery, and fun historical facts about the area. Currently, the tours are held every Saturday afternoon in Delray Beach along Atlantic Ave and the third Thursday of every Month in Pineapple Grove. There are occasional evening tours, as well. Savor Downtown Boca is the newest of the bunch and the inaugural tour took us through Royal Palm Place — just a little farther south from Mizner Park on Federal Highway. Royal Palm Place has so many restaurants, with new ones popping up almost every month. Although I’ve been to quite a few in the plaza, there are still many more I’ve yet to explore. We all got “A Taste of Royal Palm Place” and I would put money on it that each and every guest will be back for more very soon! Our first stop of the night was at one of my absolute favorite Italian restaurants — Ristorante Sapori. Chef Marco is the sweetest man ever and always aims to please. Remember my review of the restaurant and my crazy craving for linguine and clams? He came to my rescue that night and we still laugh about it whenever we see each other. Chef served us homemade fettuccine, which he prepared right in front of us with his pasta maker, and promptly served alongside his delicious flavored butters and freshly baked bread. I’ve never had fettuccine Alfredo quite like this before — it was light and airy, not weighed down with heavy cream like most Alfredo dishes. And that fresh pasta made all the difference! Many of us would have been content sitting there all night eating plate after plate of Chef Marco’s pasta, but alas…we had more tasting to do! Read the rest of the review and see more pictures here! Shaina from Take A Bite Out of Boca had never been to PGA Commons until Savor Our City started doing tours there. There was lots to see and do during the Savor PGA Commons Tour! Savor Our City Culinary Tours is bringing its historical food tours up to Palm Beach Gardens so even more South Florida foodies can join in on the fun. The inaugural tour was on Wednesday, July 30th and will continue to take place on the last Wednesday of every month. Denise is on a roll with her culinary tours! I was pumped to be able to go on the first ever tour at PGA Commons, a quaint outdoor shopping and restaurant area very similar to Mizner Park, located in Palm Beach Gardens. This is the perfect spot to host a walking tour — there are so many different kinds of restaurants to try and we even got to check out a gorgeous art gallery too! Savor PGA should be described as more of both a food AND wine tour, because we were lucky enough to receive pairings at EACH restaurant! This tour was the biggest group Denise has had thus far, which was super exciting. Despite the stormy weather, 26 people joined together under the outside awning at Vic & Angelo’s where we all met up to get acquainted with one another before spending the next three hours together eating, drinking, learning fun facts about the area, and forming new friendships. Once our name tags were handed out and the skies started to open, we headed inside to be seated for our first taste of the tour. I had just experienced Vic & Angelo’s in Delray Beach for the first time and loved it so I was happy to be back here to try something new. They served us our choice of a Chardonnay or Cabernet Sauvignon (I went with red — I like to drink red wine when I eat Italian food) and of course had a plate of their signature garlic bread on the table for us to start with. That bread…so garlicky and topped with a generous sprinkling of parmesan cheese, fresh out of the oven and crisped to perfection — I’m not sure I’ve ever had garlic bread quite like theirs before. Read the rest of this review and see more pictures here! Shaina Wizov of Take A Bite Out of Boca recaps her very first experience with Savor Our City Culinary Tours. Delray Beach is so rich with culture and cuisine, it’s about time someone starting showing it off! My good friend Denise has introduced a new concept to the area, Savor The City Culinary Tours. Denise is famed around town for putting together great pairing events with her company “Denise’s Foodie Events,” so she is a natural choice for leading these tours. Her first tour “Taste Atlantic Ave” takes you up and down the avenue, where you get to sample food and drinks from four restaurants and visit two gourmet specialty shops. Aside from the food, you also get to hear stories and fun facts about Delray Beach and its history from Denise. She interviewed local families and historians to find out some really cool info to share with her tour guests. A group of ten of us joined Denise this past weekend. Among our group was Shanna from Boca Locals who puts together the ABZs Networking Crawls, and Stevie, a former chef and fellow local food blogger at Fork Notes. Gotta love when foodies unite for fun food-centered events! The day started off at The Office, where we were served a bit of an indulgent sampling of their menu items: their Prime CEO Burger with sweet onion and tomato confit, bleu cheese crumble, gruyere, arugula and bacon, truffle fries and a beer. Yes, this was at 11:00 in the morning. Breakfast of Champions! Pineapple Grove is full of yummy restaurants. Shaina from Take A Bite Out of Boca had a great time trying them all on the monthly Pineapple Grove tour. You all know how much I love going on food tours. What could be more fun than exploring a city and all that its culinary culture has to offer? You remember the Taste Atlantic Ave tour I went on last month with Savor the City Culinary Tours, right? Well, last week Savor the City Culinary Tours debuted its first Pineapple Grove Tour and of course I was there, ready to take in every last bite! The Pineapple Grove Tour focuses on the area of Downtown Delray beyond the Ave. Those “off-the-beaten-path” kinds of places that take a local’s knowledge to know about — which is why this tour is so great; it’s introducing people to restaurants they may not have known existed. On the third Thursday of every month, my fellow food-loving friend Denise Righetti leads her Pineapple Grove Tour, in conjunction with Artist’s Alley (a time when local artists open their studios and galleries to the public), to give her guests a little taste of all that the Grove has to offer.